IT LOOKS like the Miami Heat won't have to breathe hard to earn a return trip to the NBA Finals. After a see-saw first half that ended in a 46-46 tie, the Boston Celtics offered little resistance as LeBron James and the Heat raced to a lopsided 93-79 victory in Game 1 of the Eastern Conference Finals, Monday night at the American Airlines Arena in Miami. With a 1-0 lead in their best-of-7 series, the Heat move three games away from the NBA Finals, where they hope to redeem last year's disappointing defeat at the hands of Dirk Nowitzki and the sweet-shooting Dallas Mavericks. James, this year's NBA MVP, led the way with yet another stats sheet stuffer -- 32 points 13 rebounds and three assists. 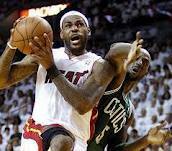 But it was Dwyane Wade's third quarter explosion and Miami's doberman defense that largely sealed Boston's fate. Fueled by 10 of Wade's 22 points, the Heat went on a 26-15 tear that tore Game 1 wide open in the third stanza. And as the Heat's offense picked up, the Celtics' attack sputtered, no thanks to slow ball movement and a pesky Miami defense that netted four steals, eight turnovers and a postseason high 11 shotblocks. Kevin Garnett had 23 points and 10 rebounds to keep the Celtics within striking distance, but he got little support from the two other cast members of Boston's Big Three. Paul Pierce only had 12 points on 5-for-18 shooting while Ray Allen, playing with a gimpy ankle, missed 6 of 7 shots to finish with six points. Rajon Rondo came close to a triple-double -- 16 points, nine rebounds and seven assists -- but he only swished 8 of 20 field goals. The Celtics shot miserably, converting just 32 of 81 attempts for a 39.5 percent clip. And even when nobody was guarding them, the Celtics were bad, making only 11 of 21 free throws. Boston was also badly outrebounded -- 48-33. WHILE Kevin Garnett looked like an island, fighting Boston's cause almost single-handedly, Wade and James received abundant team support in the face of Chris Bosh's absence due to an abdominal strain. Shane Battier shook off a postseason slump and netted 10 points and 10 rebounds while Mario Chalmers chipped in 9. Mike Miller sank two 3s and added eight points for Miami, which shot 50 percent from the field (36-of-72) and 20 percent from beyond the 3-point arc (5-of-25). The Heat had their own issues from the free throw line --- 16-for-23 ---- but they made up for it by generating more assists, 17-12, and committing less turnovers, 12-8. Worn and wearied by the Philadelphia 76ers who took them to a Game 7 in the East Semifinals, the Celtics gallantly tried to catch up with the well-rested Heat who needed only five games to dispose the rugged Indiana Pacers. And though the Celtics, who never led throughout Game 1, tied the contests four times, they lost steam in the second half as Miami's high-octane offense took hold.